This past Friday, Nest family, partners, and friends gathered in what might seem like an unlikely venue for a nonprofit event: a bank. But when you are discussing the major funding gap for artisan work, the second largest employer of women globally, the setting is really a perfect fit. 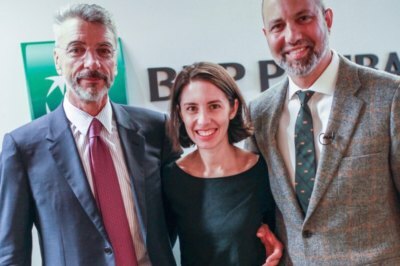 At the BNP Paribas headquarters, we were a diverse crew of philanthropists, NGO leaders, impact investors, academics, artisan business leaders, government ambassadors, policy makers, industry brands, and people who plain old care. But as WWD put it so well in their recap of what was now Nest’s second annual New Handworker Economy Convening, the day was exactly about this: bringing different groups together to encourage and foster collaboration. About aligning funding solutions across multiple sectors to ensure that the most vulnerable but high potential workers in the supply chain – artisans and homeworkers – finally have the fair opportunity to thrive. We are fortunate at Nest to call companies like BNP Paribas, Target, West Elm, PVH, QVC, and more our partners. We are humbled to call thought leaders like keynote speaker, J Crew CEO Jim Brett, our advisors. We are grateful that the artisan population we are working with and for are purveyors of culture, community activists, and people we look forward to welcoming to town each year for our annual Leadership Summit. The convening wouldn’t have been complete without them in the room. Our medium is craft, which Jim Brett so boldly stated has helped make him the man he is today – it is an economic and social force with an uncanny ability to “maintain relevance while remaining authentic”. We share his sentiment that the last thing we want is for anything to be the same. And that’s why we’re so excited about change. When we bring our funny family together, that’s when we really feel palpably that change is possible – big and lasting change – the type that will make the world a better place. Thank you to everyone who joined us for this important day.